Ummm….seriously? Do they teach math in Cali? Just curious. Wow! I think I’d have to pass on this “deal”. That dang Safeway! Or was it Vons. Leave the store to run other errands. Return and buy two more. That’s my solution – – – and the BEST deal. 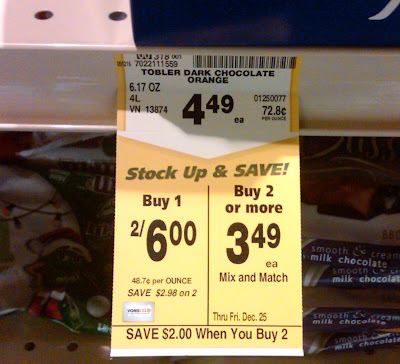 Wait a minute – – – the left side says 2/$6 but the right side does kinda negate that, doesn’t it????? I think they’d HAVE to sell you 2/$6 since the left side says so. I wonder if the same person that said you can’t cut a round pizza into square slices made that sign! Would you please go buy one and see what it rings up as? I’m thinking they got something backwards here. You are the best at finding the FAIL moments! When chocolate is involved, they BETTER get it right!!! Oh my, this hurts my head and makes me want to eat chocolate as the cure-all. Buy 1: 2/$6 so I guess that’s just multiple times through the express lane with one chocolate each time.